Cause of her death was heart failure. 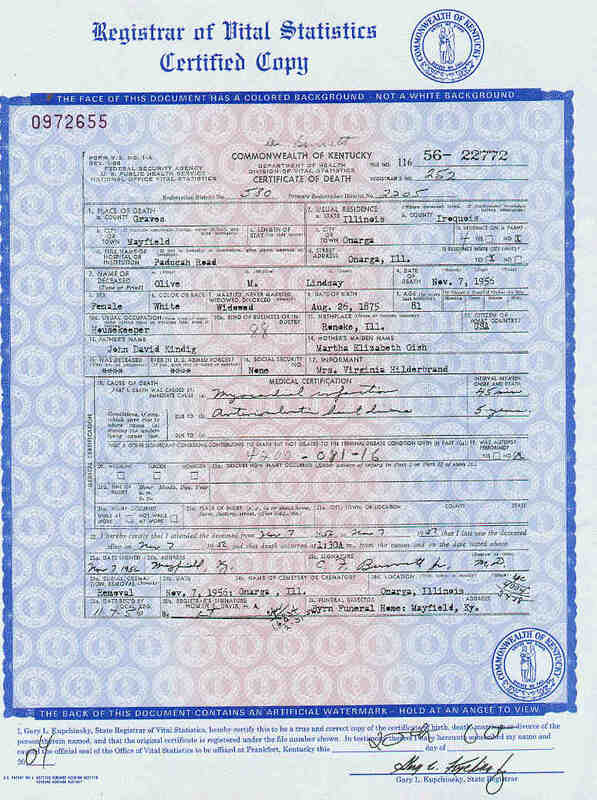 Died while en route to Florida with her daughter, Virginia, and her son-in-law, Ellis J. Hildenbrand, at the age of 81. • She appeared on the census in 1900 in Onarga, Iroquois County, Illinois. She lived in the household of her husband. 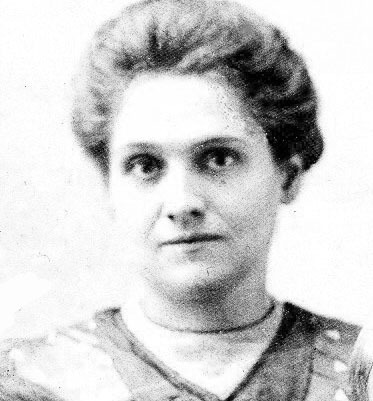 • She appeared on the census in 1910 in Onarga, Iroquois County, Illinois. She lived in the household of her husband. • She appeared on the census in 1920 in Onarga, Iroquois County, Illinois. She lived in the household of her husband. • She appeared on the census in 1930 in Onarga, Iroquois County, Illinois. She lived in the household of her husband. • She appeared on the census in 1940 in Onarga, Iroquois County, Illinois. She lived in the household of her husband. • She was a member of the Onarga Christian Church (309 W. Seminary) in Onarga, Iroquois County, Illinois. • She was buried at Onarga in Onarga, Iroquois County, Illinois. 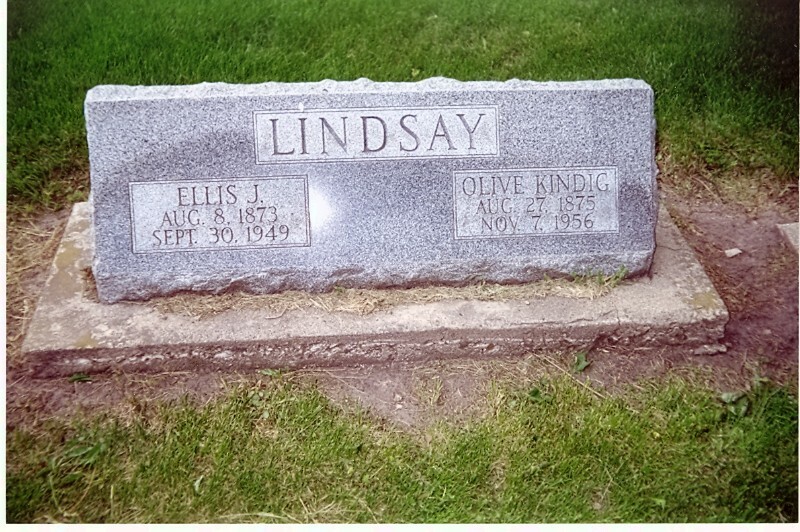 Olive married Ellis John Lindsay, son of Benjamin Franklin Lindsay and Catherine Frances Wiswell, 29 December 1897 in Danforth, Iroquois County, Illinois.22 (Ellis John Lindsay was born 8 August 1873 in Onarga, Iroquois County, Illinois 25,26, baptized 28 November 1894 in Onarga, Iroquois County, Illinois, died 30 September 1949 in Beaverville, Iroquois County, Illinois 25,26 and was buried 3 October 1949 in Onarga, Iroquois County, Illinois at Onarga Cemetery 26.) The cause of his death was stroke.